Life is not easy for Angelica Reigns. She's trying to make a life for herself in the city but when a secret cabal begins to hunt her down it turns her world upside down. It's hard enough being a young single woman in Chicago looking for employment and balancing a social life but add in magical powers and a murderous cult and things can get out of hand quickly. Such is life for Angelica who just wants to ace her job interview and have a romantic date with Josue who also has magical powers. Unfortunately, things don't work out exactly as she planned. Writer Brian Hawkins establishes the secret cult, The Faith, from the beginning revealing what its bloody pursuits are. They want a pure world and must seek out and destroy the embodiment of evil in the "Dark One. "They've been doing this secretly for centuries protecting us from dark forces. And now The Faith has Angelica in their crosshairs. The story unfolds quickly, the pacing brisk but not too fast providing enough details without leaning too heavily on exposition unless absolutely necessary. Angelica shows just enough personality to convey a sense of humor and likability. The Faith are ruthless and self-righteous but maybe not the best detectives in determining who gets testing for being the Dark One. They're very stabby, sometimes blindly so. Otherwise, they make the perfect evil cabal but are they evil? The cliffhanger muddies the waters a little bit. Federico Sabbatini and Chiara Miriade create a colorful cartoonish comic with great character designs and rich deep colors. The layouts are fairly concise and thoughtfully choreographed. The script and art go hand-in-hand to propel the action and develop the drama. It's a good-looking series. 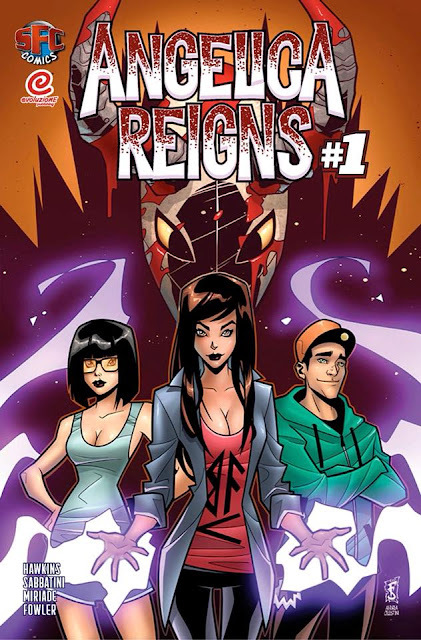 'Angelica Reigns' is a fun supernatural thriller that is vibrant and fast-paced. It carries an independent spirit of emerging talents whose influences are on full display with a keen eye for storytelling. If you like titles like Witchblade and Vampirella then you'll love this.